Get up to speed on job-ready digital skills in Goodwill Industries of Fort Worth’s Digital Career AcceleratorSM— a state-of-the-art training facility designed with you in mind. Training is free and instructors are available to help you learn basic computer skills that would be used to establish an email address, apply for a job or perform many entry-level tasks such as word processing, email and Internet use, providing digital skills that develop more marketable workers for the digital age. Goodwill Fort Worth will also offer 100 individuals the opportunity to receive free Microsoft Office Specialist Certification in Word, PowerPoint, Excel, Access and Outlook. The free certification is available on a first-come, first-served basis. The Digital Career AcceleratorSM aims to carry on Goodwill’s mission of serving people with disabilities and disadvantages, youth, older workers, veterans and military families, and people who are transitioning back into society. Clases disponibles en español. Para español, llame al 817.332.7866 x2188. Courses in the Digital Career AcceleratorSM are free to all and are self-paced while being taught in an instructor-led classroom setting. 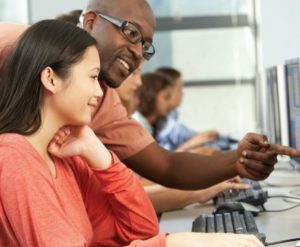 Enrollment includes a Basic Computer Skills Assessment which determines the student’s goals and plan for the course, based on current skill level. Classes include Basic Computer Skills, Internet Basics, Windows OS, Email, Word Processing and Google Suite. Click to view a full class schedule for Fort Worth or Denton. Classes range from 1-2 hours and feature an explanation and demonstration of the subject as well as a hands-on learning opportunity. Students will graduate to each new lesson by completing and passing (85%+) a Northstar Digital Literacy assessment. For more information on this program, complete the form below, email us at digitalca@goodwillfw.org, or call 817.332.7866 x2062 or 2188. How did you hear about us? * Referal Agency	Flyer	Website	Social Media	Case Manager/Goodwill Employee	Other	 How did you hear about us?